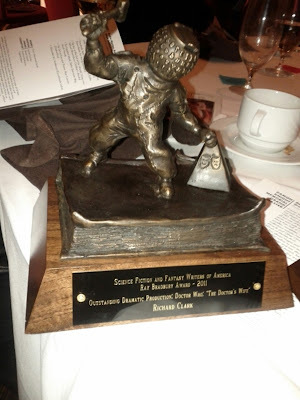 Life, Doctor Who & Combom: Neil Gaiman & Richard Clark Win Bradbury Award for "The Doctor's Wife"
Neil Gaiman & Richard Clark Win Bradbury Award for "The Doctor's Wife"
What I want to know is who the hell saw any merit in "The Adjustment Bureau" or "Source Code"? Do the Nebula Awards get voted on by stoners or what? "It beat out a lot of other crappy sci-fi dreck" - well that wouldn't be a way to describe Midnight in Paris. Have you seen it? Agreed! And "Hugo" is "crappy sci-fi dreck??" Hugo was sappy, over the top special effects dreck to me, but for those that like that sort of thing it's the sort of thing they like. Mmm - well, "Midnight in Paris" more fantasy than sci-fi, but then often Doctor Who is more fantasy than sci-fi, but at least nearly all the time it takes technology to travel in time in Who. I did enjoy watching it once, but that was about all the times I would ever be interested in watching it. Not that Allen isn't good, but for a movie you might enjoy seeing more than once, check out "Match Point", the best film he made in decades.